Rabbit Nola with her three babies. The baby bunnies like to drink a sip of mama rabbit and attach themselves with magnets. From Manhattan Toy from America. Nola is 26 cm. You can also play seperately with the bunnies. 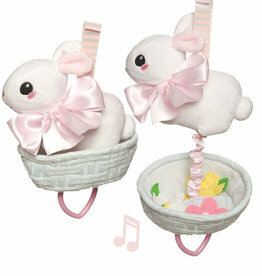 Sweet & soft baby doll with a soft rattle. Created by French brand Moulin Roty. Sweet & soft Jellycat puppy!